We weren’t wearing a suit or a dress, but Atlanta does have its fair share of days where you can wear nice clothes. We were peeling off the layers today. We did have traffic stuck behind us at one point, but where the streets are wide (Virginia), or there are bike lanes (Edgewood), traffic had no problem getting around us and more than one neighbor shouted out in greeting. One of the things we love about VaHi is seeing our neighbors when we’re out and about — thanks for putting your top down so we can see your face. Folks on the BeltLine had their tops ALL the way down. Kids learning how to ride, families in a six-seat pedal-mobile, runners, dog-walkers, elderly pedestrians out for some sunshine. Us versus them? This is the true majority — not limited to those who are licensed to operate a motor vehicle. We took nobody’s space in the parking lot, but the bike racks were full near the BeltLine. Although there were a lot of folks on the BeltLine, there weren’t as many as last weekend when we joined another couple to find dinner by bicycle in Inman Park. Snaking through the slow-moving crowd made us long for 20-foot wide pavement instead of just 14. Perhaps we’ve underestimated how popular getting out of the car might be. Atlanta Streets Alive comes to mind. 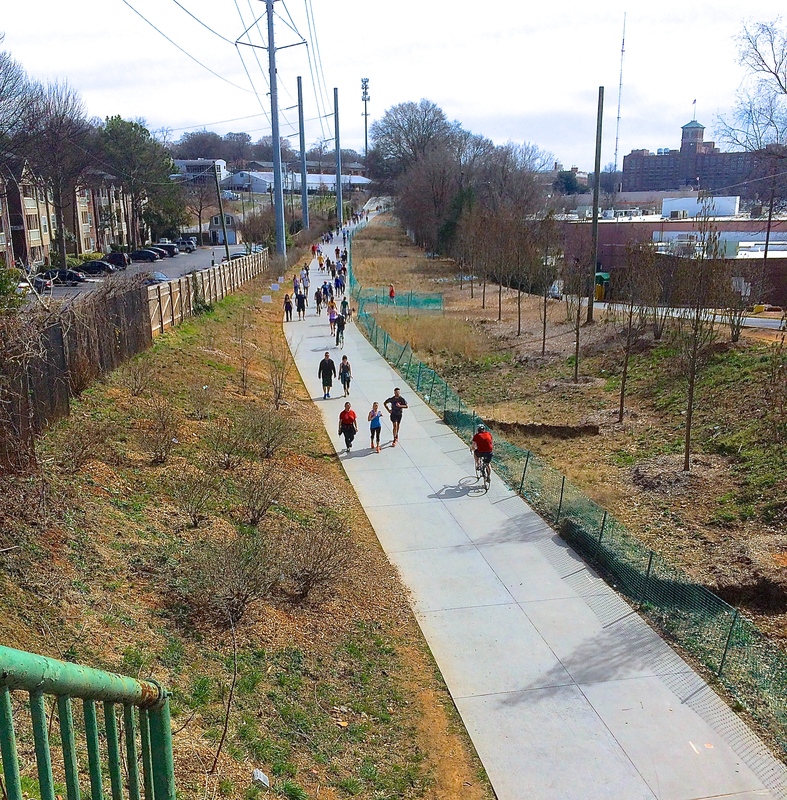 It doesn’t appear that real-estate developers along the BeltLine intend to make the mistake of underestimating. New buildings and activity were everywhere along our route. Indeed, 60% of new development over the past five years has been in walk-able communities. This fits a trend of younger adults driving much less — per capita vehicle miles has fallen the past decade — and more focus on livability and local community. Maybe we should pay attention to the trend developers and investors see. Maybe we should notice we’re next door to the city’s best park, the city’s best multi-use trail, and yes, maybe we should notice that we’re already recognized as one of the most walk-able neighborhoods in the city. Maybe we should notice that we’re situated directly between the only two bike-friendly universities in the country within the same city (Georgia Tech and Emory). Maybe we should take note that when Virginia-Highland is ranked as a livable community, that the ability to drive 50 MPH down Monroe isn’t one of the criteria. Old Fourth Ward, Inman Park, Midtown have noticed. They’ve noticed what it takes to draw youth and talent. They “get it” — errands in a car are just another chore, errands on a bike is building community, it’s keeping money local, it’s healthy, and it’s just plain fun. This entry was posted in news and tagged 2014, beltline, cycling by John Becker. Bookmark the permalink.